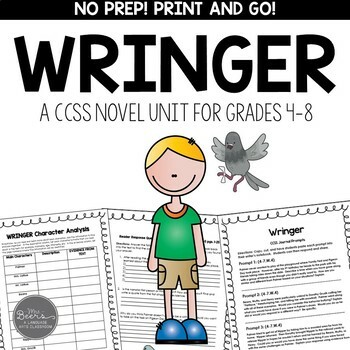 Wringer by Jerru Spinelli is the perfect novel for your grades 4-8 readers. 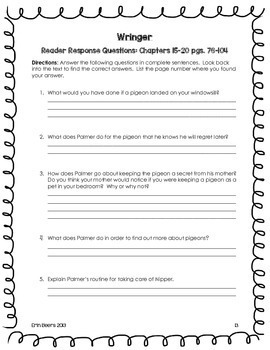 Grab this NO PREP-Print and Go Novel Unit with ANSWER KEY! Wringer by Jerry Spinelli is the perfect middle grades novel for so many reasons. Wringer is about a boy named Palmer LaRue who lives in the town of Waymer. Waymer is known for its Family Fest, which is held every year in August, four weeks after Palmer's birthday. Family Fest has an event called Pigeon Day, which is the culmination of the week. During Pigeon Day, sharpshooters pay a fee to shoot as many pigeons as they can. Many pigeons are killed on the spot, but some fall to the ground in need of being "put out of their misery." That is where "wringer boys" come in-to wring the necks of downed pigeons. At the age of ten, boys can become wringers. The story follows Palmer and his struggle with the idea becoming a wringer, and an unusual friend that changes his mind forever. This novel deals with the issue of peer pressure and the importance of standing up for what one believes in. Other themes include: friendship, animal rights, courage and bravery, and heroism. Your students will not want to put this novel down. 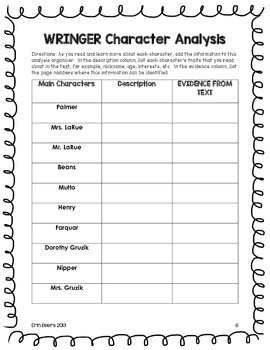 Wringer CCSS Novel Unit for the middle grades is the perfect component to go along with this novel. 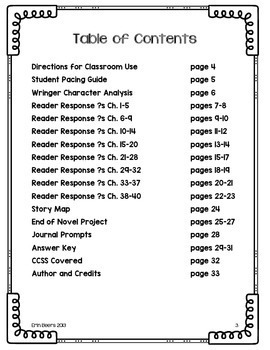 Whether you chose to do a whole class unit, small groups, or independent novel study, this is the product for you. Novel not included in packet. I would love your feedback on this product. Also, feel free to FOLLOW me so that you have the chance to find out about any new novel units, reader's theaters, or other language arts materials for the middle grades I create as soon as they are posted.